On a larger screen, Gutenberg’s layout will look a little like screenshot 1 below. If it doesn’t then it’s possible you’re in a full-screen mode. To the right of the ‘Publish’ button, you’ll see a smaller button with a cog on it (which is labeled ‘Settings’). If you click that button, it will toggle the sidebar. You’ll notice I’ve highlighted an area on the right hand side. That’s Gutenberg’s sidebar. Screenshot 1: The large-screen gutenberg editor with the sidebar highlighted. By default, if you haven’t clicked on anything in the main content area, the ‘Document’ tab will be selected at the top of the sidebar. This is for settings and controls that are to do with the document as a whole. If you click on – or add – a block, the sidebar will switch to the ‘Block’ tab. In screenshot 2 below, I’ve clicked on the image block and you’ll see the sidebar has switched to show the settings for that particular block. Each group of settings for a block is contained in a panel. For example in screenshot 2 you’ll see the ‘Image Settings’ panel is currently expanded, and at the very bottom of the screenshot, you’ll see the ‘Link Settings’ panel that’s currently collapsed. Screenshot 2: Gutenberg’s sidebar switches to the Block tab when a block is selected in the main content area. How do I add a custom panel to the sidebar? 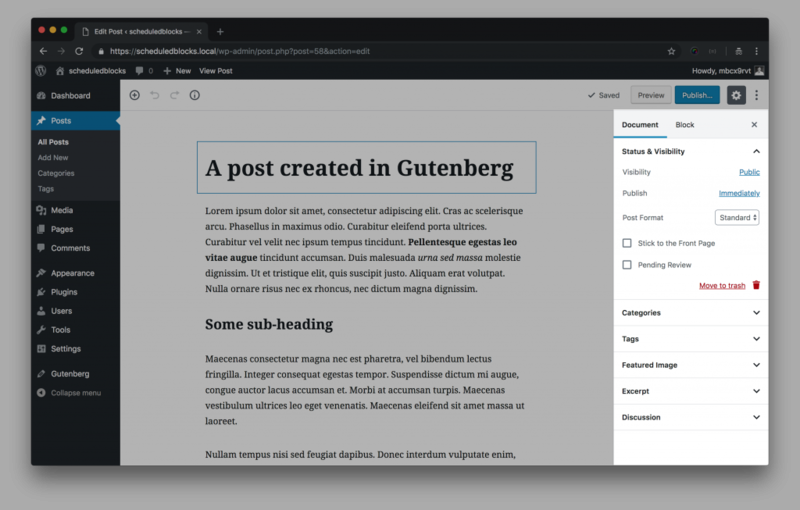 Now that we have some of the nomenclature out of the way, we can discuss exactly how to add a custom panel, with a custom field – called a control in Gutenberg parlance – to the block sidebar. Screenshot 3 shows us exactly what we’re going to create. Screenshot 3: The block sidebar for a paragraph block with our added custom panel and control highlighted. 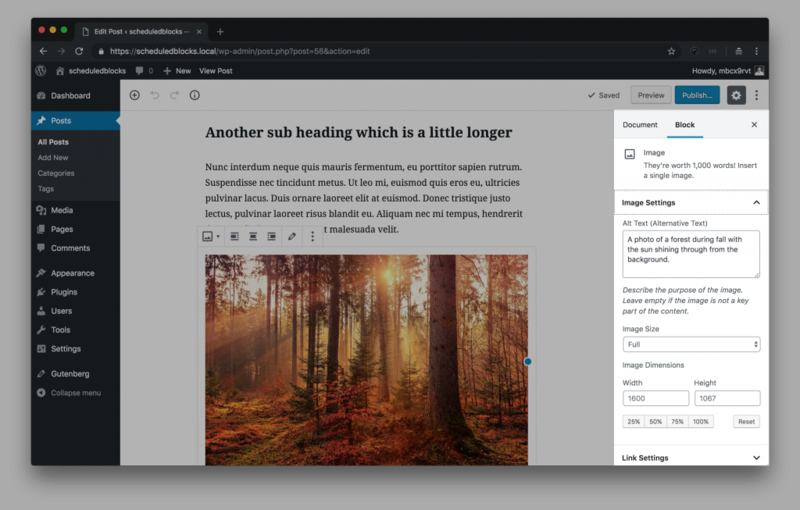 If you’ve developed metaboxes and custom fields for WordPress in the past, you can think of the sidebar panel as being the metabox, and the control as being the custom field. However, the control differs from a custom field insofar as the control directly ties to a block. Further, a control can impact how a block looks or functions in the main content area alongside where it’s being manipulated as well as on the front-end of your site. There’s 3 parts to adding a sidebar control in your own custom panel. You’ll notice a call to isValidBlockType() in there. This is a custom function which basically allows you to determine which blocks you want your sidebar panel to display on. It is passed the name of a block. At the end of this post is a list of the currently available (as of Oct 4th 2018, and version 4.0 RC1 of Gutenberg) block names. Put all those pieces together and you’ll have your custom control, in your custom panel, that will (in this example) show up if you click on either a paragraph, image, or heading block but not if you click on any other block. The data saving is handled for you automagically by Gutenberg, so when the post is updated/published, your data will remain. I’d like to thank, wholeheartedly, all of the folks who are working so hard on making Gutenberg amazing. It’s no small task they’re undertaking, and I’ve been delighted to see how much progress has been made in the past few weeks and months. 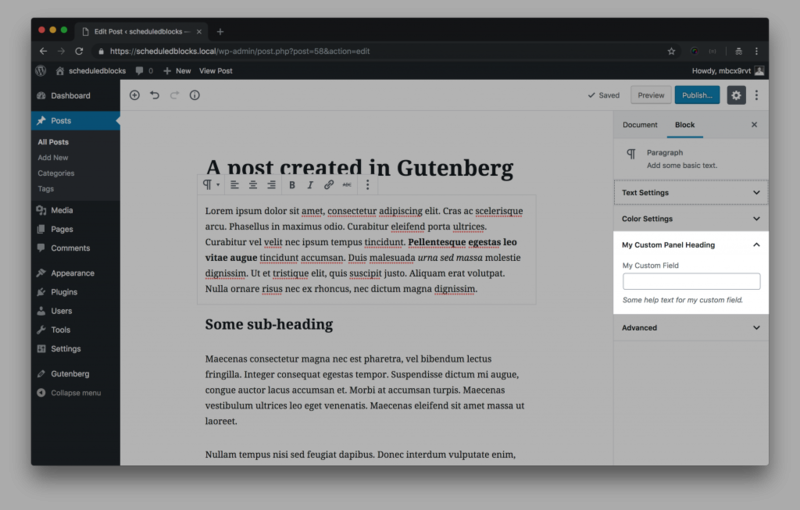 Gutenberg is the future of WordPress. It might be the future of content management systems as a whole. Also I’d like to thank Timothy Jacobs and others in the PostStatus slack team for help with pointing me in the right direction with this code.